Yesterday was a huge day for VMware's Management BU which released several updates to their product offerings within their vRealize Suite 6.x including some new products like the new vRealize Code Stream mentioned during this years VMware Europe Conference. Prior to GA, I had already received several Automation questions regarding the upcoming vRealize Operations Manager 6.0 (vROps). Luckily, I had a couple of days to play around with the new release before it was made public and I must to say, I am quite impressed at how easy and intuitive it is to deploy and configure the new vRealize Operations Manager 6.0. To make it even easier for customers to evaluate the new release, I wanted to take a look at how you can easily automate both the deployment and configuration of the new vRealize Operations Manager. I have broken the process down into three parts: deployment using ovftool which will include both a non-Windows as well as a Windows solutions for my PowerCLI buddies, initial configuration using the command-line via a shell script and finally the same identical initial configuration but using the new vRealize Operations Manager Cluster Mgmt API (also known as the CaSA API which stands for Cluster and Slice Administration). 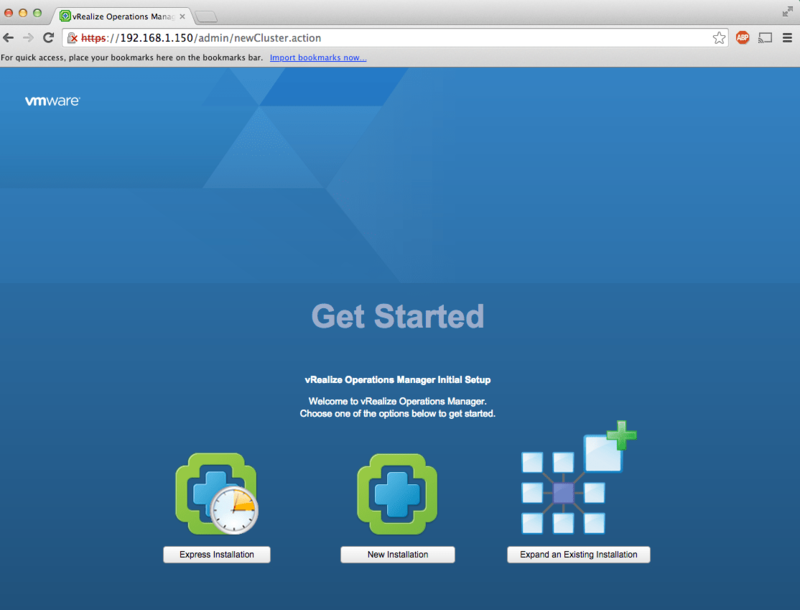 As mentioned already, this first article will focus on deploying the new vRealize Operations Manager OVA using ovftool. 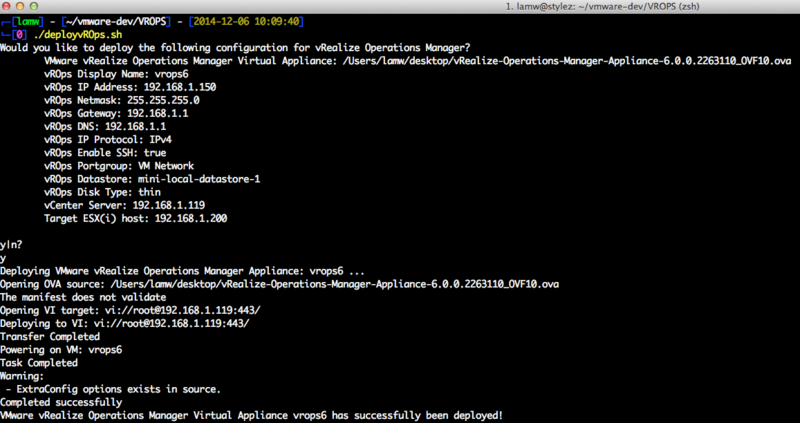 Previously, the vCOps VA was deployed as a vApp that contained two Virtual Machines. The new architecture provides a more dynamic approach and a new capability has been brought into the application that allows you to easily scale out the various vROps "roles" such as the Admin, UI, Data, Data Collector and Replica. This greatly simplifies the initial deployment which is always a plus in my book! I have created a simple shell script called: deployvROps.sh and there are several variables that need to be edited based on your environment including the path to the OVA. Please take a look at the script prior to executing. You will be prompted to confirm the configurations you have specified before the OVA is deployed. If everything was successfully deployed, you should see your new vROps VM power up. Next, open a browser to either the IP Address or hostname of your vROps VM and you should see the following landing page as shown in the screenshot below. At this point, you have completed the deployment of vROps 6.0. As for next steps, you can either manually proceed to configure your new vROps instance or stay tune for Part 2 where I will demonstrate how you can easily automate the initial vROps configurations. Note: There is a hidden OVF property called guestinfo.cis.appliance.ssh.enabled that will allow SSH to be enabled upon deployment. To be able to configure this property, you must add an advanced ovftool option called --X:enableHiddenProperties which the shell script already takes care of. Unfortunately, for PowerCLI's Get-OvfConfiguration cmdlet, these custom options have not been implemented and hence you will not be able to turn on SSH when using the PowerCLI method. I have already filed an FR internally for this and hopefully see this in a future release of PowerCLI. Here is a Windows solution to deploying the vRealize Operations Manager called Deployment.ps1 using PowerCLI's Get-OvfConfiguration cmdlet and I have contributed a new sample to Alan Renouf's PowerCLI Deployment Repository. Before running the Deployment.ps1 script, you will also need to edit the variables in the script to match your environment. Now that you have your new vRealize Operations Manager deployed, you can manually go through the guided wizard for the initial configuration or stay tune for Part 2 where I will demonstrate you how you can easily automate the initial vROps configurations using the command-line. Iam looking for the automation of deployment of vROPS including the configuration like (set the username and password,accepting the EULA etc..) post creating the vROPS and installing the .pak file installation solution in the vROPS.Please share if any scripts are available to do the same.